Are you having ignition problems? Does your BMW vehicle not start? If so, this could be due to an issue with your CAS immobiliser module. 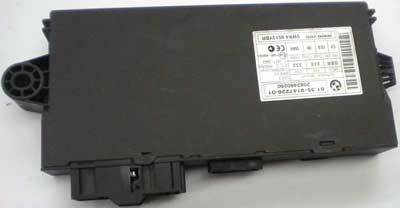 The CAS immobiliser module (transponder box) serves as an antitheft alarm system and enables the start of BMW vehicles. Within each vehicle key there is an integrated transponder chip, and a coil ring which is fitted around the ignition lock. The transponder chip is powered by this coil from the CAS module, meaning that no battery is necessary within the key. When your key is inserted in to the ignition, the transponder in the key is powered via the loop antenna, and key data is sent to the CAS control module. If the key data is correct, an enable signal is then sent to the starter and the CAS module then sends the random code to the Engine Control Module (DME / DDE) where the random code is checked against the saved random code. Only if they match, is the fuel injection released allowing the car to start. Most workshops will advise to replace the immobiliser module because they are unable to repair it. It’s not possible to replace them with a second hand part because the unit will be locked to the vehicle it came from and unless you’re buying a complete immobiliser kit, you will require a new CAS3 module and the unit must be programmed. Here at Sinspeed, we’re able to fully test and repair the BMW CAS3 immobiliser module using new genuine OEM components and uprated components where possible to ensure each and every repaired BMW CAS3 ECU is rebuilt to meet & exceed OE specifications. All remanufactured units are returned with a Lifetime warranty and will not require programming. If you have a BMW CAS3 Immobiliser fault, give us a call today on 0203 815 9441. How much does it cost to repair. Car Details: e90 250i 2005, petrol, manual. I am reaching out to you from the us. I have a bunch of fault codes for my cAS on an e93. How much would i be looking at if I was able to send you my cAS? We can certainly take a look at this for you. I have sent you an email with full information and pricing.